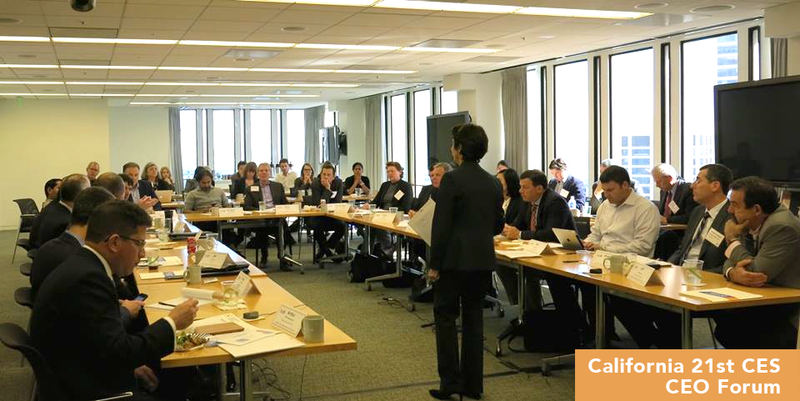 AEE Institute is helping to accelerate this transition to a high-performing electricity system by convening CEOs and senior executives of utilities and advanced energy companies, along with regulators and policymakers in targeted states. Our goals are to develop a common vision and take action on new utility regulatory frameworks and business models that are emerging to address the changes taking place in the sector. Since 2013, a series of CEO Forums have been held as part of this multi-year effort. The overarching theme that has emerged from the Forums is that of utility business model and regulatory changes necessary to accelerate innovation and advanced energy deployment to meet the multiple challenges facing the industry. Forums have addressed the full range of distributed energy resources, large-scale generation, and the intelligent grid, as well as specific state and regional needs around plant retirements, wholesale market evolution, renewable energy integration, system reliability, customer engagement, energy and environmental policy objectives, rate design, and financing structures. The rising deployment of distributed energy resources (distributed generation, energy storage, microgrids, energy efficiency, demand response and electric vehicles) is beginning to upend the traditional utility business model. In addition, the profound changes brought about by the digitization of our economy have finally hit the utility sector with full force. On top of that, policymakers are asking more of the grid and utilities as a means to achieving multiple policy objectives such as economic development and environmental policy objectives. This puts additional pressures on the regulated utility industry even as it is expected to continue providing safe, reliable and affordable electricity. AEE is actively engaged in key states where policymakers and regulators are beginning to tackle these issues in a comprehensive manner. Topics range from rate design to data access to fundamental reform of utility revenue and earnings models. Our work includes direct engagement in regulatory proceedings and facilitating more detailed discussions and collaboration among willing stakeholders to develop and implement the changes required to support the long-term viability of the utility business model while creating opportunities for advanced energy companies to contribute to meeting multiple policy objectives and enhancing the customer experience. New York. We have been deeply engaged in the Reforming the Energy Vision (REV) proceeding in New York, a first-of-its-kind effort that is seeking to fundamentally redefine the role of the electric utility. AEE Institute held a 21CES CEO Forum in late 2013, and then facilitated a groundbreaking collaborative process among advanced energy companies, the state’s major investor owned utilities, and other stakeholders to develop a position paper on what a 21CES would look like for New York State. AEE Institute also facilitated the Solar Progress Partnership that submitted a proposal in the Value of distributed energy resources (DER) proceeding. AEE Institute has filed numerous formal comments in the REV and Clean Energy Standard proceedings and other related proceedings, and expects to remain active into 2017 and beyond. California. In 2015, we hosted a 21CES CEO Forum and led a collaborative process to develop a position paper on what a 21CES would look like in California. From this paper we published four issue briefs that were presented to the California Public Utilities Commission and the California Energy Commission. AEE continues to be engaged in key distributed energy resource proceedings and legislative issues to achieve various state policy objectives around energy and transportation. The emphasis is on regulatory and business model changes needed to facilitate the transition to a low-carbon, customer-focused, efficient, reliable and resilient grid in California. New England. We hosted a 21CES CEO Forum and are currently facilitating discussions among utility executives, advanced energy companies, and other stakeholders on the important topic of Rate Design for a DER Future in New England. Pennsylvania. We hosted a 21CES CEO Forum and facilitated the development of a position paper on performance based regulation to drive innovation in the utility sector in Pennsylvania. Following the release of our position paper, AEE continues to be engaged in Pennsylvania through their alternative ratemaking proceeding. National Association of Regulatory Utility Commissioners (NARUC). AEE maintains active engagement with NARUC. In 2016, we submitted formal comments during development of their DER Compensation and Rate Design Manual, which is intended to assist jurisdictions in navigating the challenges, considerations, and policy developments related to the increase in DER on the grid. The multi-stakeholder working group has since produced four issue briefs, responding to broad interest in covering certain key regulatory challenges and opportunities in California in greater detail. Specific topics include: access to customer energy data, demonstration and deployment projects, the CPUC regulatory process, and workforce evolution. On August 13, a group of those involved in the writing of this paper presented the findings at a Thought Leaders forum at the California Public Utilities Commission. Comments on California’s Integrated Resource Planning Process Comments submitted by AEE in response to the California Public Utilities Commission (“Commission”) Staff’s May 16 proposal on process for integrated resource planning. Comments on District of Columbia Grid Modernization Comments submitted by AEE Institute in the matter of the investigation into modernizing the energy delivery structure for increased sustainability. Comments submitted by AEE Institute on Hawaiian Electric Companies’(HECO) Final Grid Modernization Strategy (Modernizing Hawaii's Grid for Our Customers), in response to the Commission’s invitation for public comments on August 30, 2017. Our comments focus on opportunities related to HECO’s report, and provide perspectives on regulatory practices to facilitate grid modernization. Comments on Illinois' "NextGrid" Grid Modernization Study Comments submitted by AEE Institute on behalf of AEE and its member companies in response to the Illinois Commerce Commission's Resolution establishing the "NextGrid" initiative to "develop a shared base of information and work to build consensus on critical issues facing the electric utility industry." Comments on Maryland Grid Modernization Comments submitted by AEE Institute in the matter of transforming Maryland’s electric distribution system to ensure that electric service is customer-centered, affordable, reliable and environmentally sustainable in Maryland. Comments on Minnesota Grid Modernization Comments submitted by AEE Institute on behalf of AEE and its member companies, offering stakeholder perspectives in the Matter of the Commission Investigation into Grid Modernization. Comment Letter on Interim Successor to Net Energy Metering Comments submitted by AEE Institute, Alliance for Clean Energy New York (ACE), and Northeast Clean Energy Council (NECEC) in response to the Public Service Commission of New York's request for comments and proposals on how to compensate owners of distributed energy resources (DER) in a transition away from existing net energy metering. The comments submitted jointly by the three groups propose a system of compensation that incorporates all wholesale market values and the full value of DER to the distribution system, including externalities. Comment Letter on NY REV Ratemaking and Utility Business Models Comments submitted by the Advanced Energy Economy Institute on the staff white paper on Ratemaking and Utility Business Models issued by the New York Public Service Commission in its "Reforming the Energy Vision" proceeding. REV Track One Order Summary and Alignment with AEEI/ACENY/NECEC Position Advanced Energy Economy Institute (AEEI), the Alliance for Clean Energy New York (ACENY), and the New England Clean Energy Council (NECEC) have been filing joint comments with the New York Department of Public Service (DPS) in the Reforming the Energy Vision (REV) Proceeding. Click the following link to view a high-level summary and comparison of those joint comments and the substance of the Track One Order, issued February 26, 2015. The complete Track One Order and the detailed filings of AEEI/ACENY/NECEC can be found on AEE's DocketDash. Comment Letter on the NY Reforming the Energy Vision Straw Proposal Comments submitted by the Advanced Energy Economy Institute on the straw proposal from the staff of the New York Public Service Commission, in its "Reforming the Energy Vision" proceeding, for reorienting the state's utility regulatory process to unlock the value of advanced energy to meet state policy objectives and empower customers to make informed choices on energy use. Successfully address the underlying technology and market forces shaping the “Utility of the Future"
The WG process was facilitated by Advanced Energy Economy (AEE) personnel over a three month period prior to the opening of the REV proceeding. Comments on Utility Energy Efficiency Transition Implementation Plans The Advanced Energy Economy Institute (AEEI), on behalf of Advanced Energy Economy (AEE), the Alliance for Clean Energy New York (ACE NY), the New England Clean Energy Council (NECEC), and their joint and respective member companies, submit for filing these Initial Comments on the utilities’ Energy Efficiency Transition Implementation Plans in the above-referenced proceeding in response to the Commission’s Notice Soliciting Comments, issued on August 5, 2015. Comments on Regulation and Oversight of Distributed Energy Resource Providers and Products The Advanced Energy Economy Institute (AEEI), on behalf of Advanced Energy Economy (AEE), the Alliance for Clean Energy New York (ACE NY), the New England Clean Energy Council, and their joint and respective member companies, submit for filing these Initial Comments to the Staff Proposal In the Matter of Regulation and Oversight of Distributed Energy Resource Providers and Products. Comments on Demonstration Projects The Advanced Energy Economy Institute (AEEI), on behalf of Advanced Energy Economy (AEE), the Alliance for Clean Energy New York (ACE NY), the New England Clean Energy Council (NECEC), and their joint and respective member companies, submit for filing these comments in the above referenced proceeding, in connection with the demonstration project proposals filed by the New York distribution companies pursuant to the Commission's February 26, 2015, Order Adopting Regulatory Policy Framework and Implementation Plan. Our comments focus on the several proposals that include regulated utility ownership of distributed energy resources (DER). Comments on the Large Sale Renewables Options Paper The Alliance for Clean Energy New York, American Wind Energy Association, Advanced Energy Economy Institute, Solar Energy Industries Association, New York Solar Energy Industries Association, and New England Clean Energy Council (“Renewable Energy Industry”) respectfully submit the following comments in response to the Notice Instituting Proceeding, Soliciting Comments, and Providing for Technical Conference, issued June 1, 2015 in the above-referenced proceeding. Comments on NYSERDA's Clean Energy Fund Information Supplement The Advanced Energy Economy Institute (AEEI), on behalf of Advanced Energy Economy (AEE), the Alliance for Clean Energy New York (ACE NY), the New England Clean Energy Council (NECEC), and their joint and respective member companies, submit for filing these comments on NYSERDA’s Clean Energy Fund Information Supplement in response to the DPS Notice Regarding Comments issued on July 2, 2015. Comments on the Staff White Paper on Benefit Cost Analysis The Advanced Energy Economy Institute (AEEI), on behalf of Advanced Energy Economy (AEE), the Alliance for Clean Energy New York (ACE NY), the New England Clean Energy Council, and their joint and respective member companies, submit for filing these Initial Comments to the Staff White Paper on Benefit Cost Analysis in the Reforming Energy Vision Proceeding. Comments Demonstrated Support for LSR Program The Alliance for Clean Energy New York, American Wind Energy Association, Advanced Energy Economy Institute, Solar Energy Industries Association, New York Solar Energy Industries Association, and New England Clean Energy Council (“Renewable Energy Industry”) respectfully submit the following reply comments in the above-referenced proceeding. Regulatory and Ratemaking Models to Support a 21st Century Electricity System in New York State With this RFI, AEEI is seeking to identify companies that would be able to support our continued involvement in the REV proceeding. In particular, “Track 2” of REV will be getting underway in Q2 2015 when the NY Department of Public Service (NY DPS) releases a Straw Proposal. We anticipate needing some expert support during this phase of the proceeding. Specifically, Track 2 is addressing the detailed regulatory changes needed to implement REV. This includes performance-based regulation, tariff designs and other revenue models, and rate plans. Responses to this RFI are due on April 15, 2015. Comments on Alternative Ratemaking Methodologies in Response to Pennsylvania Public Utility Commission Tentative Order Comments submitted by AEE Institute on behalf of AEE and its member companies in response to the Pennsylvania Utilities Commission's Tentative Order, issued on March 2, 2017, seeking input on alternative ratemaking methodologies. Position paper on Performance-Based Regulation for Pennsylvania: An Opportunity for Pennsylvania to Drive Innovation in the Utility Sector Performance-based regulation (PBR) is a regulatory framework that attempts to align the behavior and financial interests of regulated utilities with public interest objectives and consumer benefits. It does so by rewarding utilities for achieving well-defined performance metrics (outputs), as opposed to providing incentives related primarily to capital investment (inputs). This paper summarizes the collective thinking of an industry-based Working Group, facilitated by AEE Institute, that met over several months to develop recommendations regarding the potential for PBR in Pennsylvania. Comments on Rhode Island's "Power Sector Transformation Initiative" Comments submitted by AEE Institute and our state partner, the Northeast Clean Energy Council (NECEC), in response to the Rhode Island Public Utilities Commission's inquiry into the electric utility business model. Specifically, the comments outline our view of how the future electric utility should be structured and how it should be compensated. Comments in response to the Rhode Island Public Utilities Commission's June 2nd Notice of Inquiry into Distribution System Planning and Request for Stakeholder Comment. Comments in response to the Rhode Island Public Utilities Commission's August 15 Initial Proposals for Distribution System Planning Improvements and Request for Stakeholder Comment. Comments in response to the Rhode Island Public Utilities Commission's August 15 Initial Considerations on Utility Compensation and the August 20 Advanced Grid Capabilities and Questions for Stakeholders. NARUC Rate Design and DER Compensation Manual Comments submitted by Advanced Energy Economy during development of their DER Compensation and Rate Design Manual, which is intended to assist jurisdictions in navigating the challenges, considerations, and policy developments related to the increase in DER on the grid.